In the last two decades, empirical research has shed light on the interactional dynamics of Dialogue Interpreting (DI). Nevertheless, it remains unclear how the results of such research can be effectively integrated in interpreter education. This paper outlines a semester-long module, in which research on DI is employed for teaching purposes. During the module, students are introduced to relevant literature and exposed to different case studies of interpreter-mediated interaction, based on authentic data. The aim is to create an understanding of the interpreter’s role and conduct in a variety of communicative situations, and help students identify the challenges that may arise in interpreter-mediated interaction. Implications for current codes of conduct are also discussed. ©inTRAlinea & Elena Davitti & Sergio Pasquandrea (2018). "Integrating authentic data in dialogue interpreting education A teaching unit proposal"
Interpreting, irrespective of its type, mode or setting is a form of interaction which is multiparty, multicultural and multilingual in nature. Each interpreter-mediated event (IME) is unique in its dynamics and unfolding, and is shaped by a number of situational variables that are difficult to control and predict. This is what makes the interpreters’ task particularly complex. Empirical research on Dialogue Interpreting (DI) has widely acknowledged the multifaceted and dynamic nature of the interpreters’ role, and interpreting has been conceptualised as a decision-making process which requires the development of a set of skills, strategies and techniques, used to analyse what happens on the spot and opt for the most effective solution on a moment-by-moment basis. This practice has been successfully explored since the late 1990s by empirical studies of DI, which have investigated authentic interaction through multiple analytical lenses. Interpreters are now seen as visible, active participants performing multiple roles in mediated interaction, and there is a consensus that it is necessary to draw on in-depth, sequential analysis of interaction in order to evaluate the implications of specific interpreter moves. The more nuanced and complex understanding of DI interaction brought about by research has certainly informed the current debate on interpreter education, but it is not always clear how this can be incorporated into actual interpreter training. One the one hand, the integration of such literature in teaching is usually limited to readings on the theory of interpreting which, in our experience, students tend to perceive as rather ‘difficult’. On the other hand, practical interpreter training often relies on simulated interpreter-mediated interaction, with an emphasis only on the linguistic dimension. Cross-fertilization between teaching, research and practice is therefore necessary to bridge this gap. In this paper, we outline a semester-long module that systematically exposes students to authentic DI case studies. In our view, this activity will enhance the idea that DI is strongly influenced by the communicative situations in which it takes place. We also suggest that such module will create an understanding of interpreting as a truly interactive process where interpreters can behave in different ways and where their choices may have different implications. This is essential to develop coping strategies and the ability to make informed decisions. We envisage this module at postgraduate level, where topics can be explored more in-depth and students’ critical and independent thinking can be addressed assuming a certain level of prior knowledge. In section 2 we explore the rationale for developing this module and explain how it could complement other modules within the framework of a postgraduate interpreting course. In section 3 we discuss some key pedagogical concepts that underlie the present proposal and offer a brief review of current literature on interpreter education based on authentic data. In section 4 we discuss the broad set-up of the module and some key design principles, while in section 5 we provide some examples of materials that may be used to develop the module. The conclusion emphasizes the benefits of designing and incorporating this module in the interpreting curriculum. DI courses have gained increasing popularity over the years (Angelelli, 2017) both at undergraduate and postgraduate level, and anecdotal evidence from a number of European interpreting courses suggests that DI teaching is anchored to the linguistic dimension. At the core of DI pedagogy are methods such as simulations and role-plays (Merlini, 2007; Cirillo & Radicioni, 2017), which come in many variants (Wadensjö, 2014; Niemants, 2015; Niemants & Cirillo, 2016) and have the merit to expose students to experiential learning by promoting a task-based approach. Nevertheless, even if based on authentic scenarios, classroom simulations cannot faithfully reproduce all the variables affecting a real-life mediated encounter. Post-simulation feedback and discussion often focus on the linguistic product of students’ performance rather than on how the process could be shaped by the different choices available to the interpreter. As a result, simulations alone do not seem to enable students to immerse themselves fully in the complexity of a DI scenario and appreciate the challenges that derive from contextual variables; and, most importantly, to understand that interpreters always have a range of options available to handle such challenges, and that their decisions will have implications on crucial dimensions such as role, visibility and neutrality. We contend that, though role-play practice in the ‘vacuum’ of the classroom can help students fine-tune interpreting techniques, particularly in the initial stages of training, it is not necessarily conducive to the development of those critical reflective skills that are essential in DI, where interpreters are “called upon to make choices, to use personal judgement or to weigh conflicting social, cultural, or cognitive constraints against one another” (Kiraly, 2000: 27). A classroom environment where students feel ‘evaluated’ on their linguistic performance, rather than feeling they are actually bridging a communication gap, may reduce their performance to a mere linguistic exercise. Simulations need therefore to be complemented with activities that can help students develop the “ability to select the most suitable interpreting behaviour” on a moment-by-moment basis and in full autonomy (Merlini, 2017: 19). Ertl & Pöllabauer (2010) and Valero-Garcés (2009) rightly emphasise the importance for interpreting students to experience practice in real-life situations, for instance through internships. The EU-funded project EVIVA explored how ICT-based tools and platform can create opportunities for representative tasks and scenarios that mirror professional contexts as closely as possible. More recently, Merlini (2017) has advocated a tripartite teaching method that integrates analysis of real-life video recorded interaction with discussion of professional norms and simulations of real-life scenarios. [W]hile the participant interacts with the text as an intended recipient, the observer views this interaction from the outside, adopting a critical analytic perspective. Observer as well as participant roles can allow learning: observation allows strategies of interaction to be noticed, while participation allows such strategies to be tested. Through this post-hoc but active involvement, trainees may acquire indirect experience of challenging situations and be encouraged to develop a set of coping and adaptive strategies. They may also acquire the ability to make informed decisions when confronted with complex issues in their professional practice. In this section, we first provide a brief overview of DI studies that have looked at how authentic data can be integrated in the classroom, then we review some of the main pedagogical principles underpinning our module proposal. The complex interplay of the socio-cultural factors that shape and constrain communicative interaction in DI have been explored through different research lenses. The dominant frameworks employed are Conversation Analysis (Wadensjö, 1998; Davidson, 2002; Bolden, 2000); Discourse Analysis (Roy, 2000; Wadensjö, 2001; Hale, 2004; Pöchhacker & Shlesinger, 2007); Critical Discourse Analysis (Barsky, 1994; Pöllabauer, 2005; Inghilleri, 2005; Monacelli, 2016), and Relevance Theory (Mason, 2006; Blakemore & Gallai, 2016). More recently, proponents of multimodal approaches have argued for a more systematic analysis of the integration of embodied features and verbal behaviour (Mason, 2012; Krystallidou, 2012; 2014; Davitti & Pasquandrea, 2017; Licoppe & Veyrier 2017; Davitti, 2018, in press; see section 5.4). A common denominator of the “discourse-based interactionist paradigm” (Pöchhacker, 2004: 79) is the use of authentic data as a starting point for the analysis. One of its main merits is to have shifted the focus from an aprioristic, prescriptive, top-down approach to a bottom-up, inductive, descriptive look at what interpreters actually do. trainers establish the aims of the analysis via pre-selection of short extracts focusing on one relevant phenomenon (or a restricted set) at a time. The pre-selection of a specific analytical focus deviates from the ‘unmotivated look’ required by orthodox CA; however, it is a necessary adjustment to allow these ‘guided data sessions’ to remain focused on a specific problem, and to avoid the risk of dispersion (Davitti & Pasquandrea, 2014: 379). In section 4.3 the issue of data selection will be further problematised, with a view to providing some general guidance to trainers. In the next section, we illustrate how data observation and discussion can be reconceptualised as an activity promoting active engagement and yielding tangible benefits for our students. In line with (social) constructivist principles of learning, which emphasise the importance of social participation (Wenger et al., 2002), social interaction (Vygotsky, 1978) and of the collaborative construction of knowledge (Cornelius-White, 2007), dialogue and discussion among students lie at the core of the design of this module. Learning is conceived as a process- (rather than product-) oriented experience that should be facilitated through structured reflection, active reasoning and through “ample opportunities for repetition and gradual refinement of [students’] performance” (Ericsson 2008: 991). This is in line with a learner-centred approach to teaching, where students are prompted to engage in a process of active discovery, where they autonomously elaborate their own understanding of interpreter-mediated interaction, both through individual and collective work. Practice is key to the acquisition of the knowledge, skills and strategies which are needed to perform successfully in a DI situation. According to Ericsson (2004: 74), practice should be embedded in a representative context and “designed to improve specific aspects of performance in a manner that assures attained changes can be successfully integrated into representative performance”. Learning should be situated (Lave and Wenger, 1991), i.e. it should take place in authentic professional contexts and ‘communities of practice’ in which students may gradually become more active and engaged until they eventually assume an expert role, while continued engagement in such environment promotes expert performance (Ericsson 2000/2001). As pointed out in section 2, role-plays have been used as a training method to simulate real life situations in both monolingual and bilingual interactively demanding environments (e.g. Stokoe, 2011; Metzger, 1999). In order to compensate for some of the shortcomings of this activity in recreating the variables and dimensions that contribute to the complexity of real-life scenarios, observation and analysis of authentic DI data is suggested as a valid complementary activity. While observation can be conceived as “a fairly passive exercise compared to role-play” (Braun & Slater, 2014: 472), we propose that it should be a complementary activity not meant to replace, but to support other types of practice. According to the principles of discovery or experiential learning (Bruner, 1961; Kolb, 1984), students are not provided with answers to specific problems, rather with materials and tasks for which they themselves have to find the answers through collaboration with tutors and peers. More specifically, we propose a case-based guided learning approach: differently from pure discovery learning, participants are not left alone in their journey, but are equipped with foundational knowledge and provided with structured guidance through scaffolding techniques and monitoring throughout the module. For instance, they can acquire knowledge of how to read and make sense of complex transcripts, how to identify, understand and decompose potential problems and find solutions. The idea is to create an exploratory learning environment where students are assisted while working through different solutions; are reassured about the importance of sharing one’s view, even when in contrast with others’ views; are advancing their knowledge and skills through constant dialogue and observation. The methods used to analyse the data are mostly based on the guided data session and CARM briefly illustrated in section 3.1 and can be implemented longitudinally over a certain period of time (in our case, one academic semester). The basic idea is that this form of learning should not be introduced on a one-off basis, but functions best when students have the opportunity to gradually adjust to and develop familiarity with it. It is our view that only phased scaffolding and repetition of the same activity with different, progressively more complex material has a positive effect on the retention of information (Ray, 1961), acquisition of life-long learning skills (Dorier & Garcia, 2013) as well as creative and problem solving skills. Furthermore, an active approach to the task should promote engagement and motivation (Carroll & Beman, 2015) as well as help students develop a sense of independence and autonomy. After presenting the broad pedagogical principles underlying our teaching unit, in section 4 we illustrate some design principles underpinning the development of a (tentative) module schedule. The overall structure of the module relies on principles of sequentiality and progressivity. As a first step, students are introduced to the most common theoretical frameworks applied to the empirical study of the complex nature of DI encounters. Secondly, codes of conduct for DI are compared and discussed, and finally most of the sessions are devosted to data-driven analyses. The main goal of this module is not to delve into abstract concepts or theoretical models, but to introduce students to a more nuanced understanding of what interpreters actually do during their daily professional practice. As a consequence, each notion should be conceived as a stepping stone to the analysis of authentic data. The abstract concepts identified above should be exemplified through extracts from both dyadic and multiparty (monolingual) interaction. By doing so, students start familiarising with transcripts and can identify specific phenomena of interest. Extracts can be analysed through an inductive approach, i.e. by having students read them a few times and verbalising, in their own words, what is happening, with trainers guiding the discussion. Throughout the analysis, trainers should also start raising the main problems and criticalities an interpreter might be confronted with, in order to trigger students’ active reasoning and awareness. As a second step, one session can be devoted to the analysis and comparison of different codes of conduct developed for DI in different settings. This activity lays the foundations for understanding the mismatch between prescriptive guidelines and the wide range of challenges characterising real-life interaction, which cannot always be satisfactorily dealt with by simply applying such codes to the letter. As pointed out by Niemants & Stokoe with reference to CA research (2017: 298), “sometimes ‘best practice’ [...] contradicts existing guidance for practitioners. The implication is that when people turn guidance into talk, it might not work, and that overriding objectives may create unpredictable contingencies of interaction (i.e. professional dilemmas or choice points) which call for situated responses”. This activity therefore aims to engage students with the idea that flexibility is one of the key traits of interpreter’s behaviour. This idea can then be solidified through authentic data analysis from descriptive literature which, as pointed out by Niemants & Stokoe (ibidem), “can help us review traditional distinctions between ‘good’ and ‘bad’, highlighting ways in which apparently ‘imperfect’ practices (such as breaches of tenets of faithfulness and neutrality) can have effects on the coordination of the interaction”. Students, in groups, can be provided with copies of codes of conduct and asked to familiarise with the documents and compare the points they share, the areas in which they differ and the possible reasons for the difference. As this module is thought for postgraduate level students, a minimum level of awareness of the DI industry is expected. In line with the scaffolding and progressivity principles, trainers are required to pre-select extracts of naturally-occurring data. As pointed out by Davitti & Pasquandrea (2014), pre-selection of specific extracts is needed for analysis and observation to remain focused. Furthermore, this approach may also help students to gradually familiarize with the analytical tools that will be later employed, and will prevent them from being exposed to an excessive degree of complexity. Trainers first of all need to compile a repository of extracts whose sequences should be carefully contextualised, and in which the phenomenon (or phenomena) of interest should be clearly identifiable and observable; once isolated, they can then be linked to more theoretical constructs. A useful taxonomy has been recently developed within the EU-funded SHIFT project, which aims, among other things, to develop a framework for the analysis of orality in interpreter-mediated communication by identifying instances of both good and problematic phenomena, and the strategies implemented to deal with them. Although these categories have been developed to analyse remote interpreter-mediated communication, they can be useful in the planning stage to collect extracts that illustrate a variety of practices in any DI scenario. Categories are presented in a sequential, rather than hierarchical, order that follows the unfolding of the communicative event. This taxonomy can be a powerful to​ol to categorise phenomena of interest from extracts found in the literature or collected by the trainers, in order to identify paradigmatic examples to be used in class. The next step is to collect and group together extracts in a way that is progressively more complex and that raises students’ awareness of different aspects of interpreter-mediated interaction. First of all, it should be established whether the analysis focuses on the same (or similar) phenomenon across a range of extracts in different settings and/or in different sequential environments (narrow focus), or on more complex chunks presenting two or more phenomena together (broad focus) (see Davitti & Pasquandrea, 2014). In the case of a narrow focus, the selected extracts can be presented together (bundle approach) to show how the same phenomenon has been dealt with. A broad focus applies to longer chunks, presenting more than one phenomenon of interest within the same sequence (cluster approach). What are the main learning points of today’s class? What have you realised in relation to interpreter-mediated interaction? Do you think what you have learnt today could help inform interpreter’s daily practice? If so, how? Has your perception of codes of conduct changed? If so, how? Do you deem this kind of analysis useful/interesting/fruitful? effectively prepare for an assignment in these contexts, anticipate criticalities, educate clients. The ‘data analysis’ phase of the module is undoubtedly the most delicate and challenging stage, in which trainees have the chance to put in practice what they have learnt and are required to engage with naturally-occurring data. Yet, a data session requires participants to have an already developed competence in the field of CA for its analytical tools to be applied rigorously. Therefore, methods such as CARM and 'guided data sessions' are proposed for the analysis (see section 3.3). In this section, we will provide some examples of materials that can be used for a session centred around the concept of participation. On the one hand, this is a highly debated concept in DI, particularly in relation to the degree of participation of the interpreter in the communicative events, which links to other key notions such as visibility and neutrality. It is therefore a concept worth exploring as it often clashes with what is advocated by various codes of conduct. On the other hand, participation is a deceptively simple concept, prone to (over)simplification. Therefore, for students to fully grasp the interactional dimension of DI, this concept needs to be carefully analysed and deconstructed. The concept of participation can be introduced in the first part of the module by looking at Goffman’s (1981) classic treatment of footing and participation frameworks, in order to show that “participating in a conversation” may be something more complex and far less obvious than commonly assumed. Goffman’s concepts, first applied to the study of DI by Wadensjö (1998), are taken up by Baraldi & Gavioli’s volume (2012), which is entirely dedicated to problematizing and reassessing the notion of participation in interpreter-mediated interaction (see, for instance, Pöchhacker 2012). To integrate and explain such readings, brief excerpts of authentic data that exemplify shifts in participation frameworks can be shown in the classroom. Having introduced students to a more subtle and nuanced notion of participation, the second step in the module is to explore how interpreters’ participation is treated in existing codes of conduct. Active participation - e.g. in the form of expanding and paraphrasing, or autonomously initiating new sequences - is often stigmatised as inappropriate and unprofessional. Different codes can be used to highlight similarities and differences about what is expected of interpreters (fig. 1). The point of the activity is to show that the dynamics of real-life interaction do not necessarily coincide with polar opposition between “good” or “bad” practices. An example of such actions can be seen in fig. 2, where the concept of close rendition, which is advocated by codes of conduct, is challenged when the mediator (M) not only translates the doctor’s (D) question in line 14, but also prompts the patient to provide useful information, which was not explicitly asked for by the practitioner. Sequences such as that in fig. 2 can be discussed in order to highlight, firstly, that interpreters’ actual practice often do not coincide with what codes of conduct prescribe and, secondly, that such discrepancies do not necessarily lead to “bad practices”. As a result, students can also start familiarising with simple examples of data analysis, before they move on to more complex ones, as exemplified in the next sections. In the third phase of the module, students are introduced to autonomous data analysis. The examples proposed here address a phenomenon falling within the ‘Managing turn’ category, namely the handling of dyadic sequences, i.e. instances where the interpreter breaks the triadic participation format and initiates sequences with only one of the parties. This phenomenon, already seen in the extract in section 5.2, is embedded within a more complex sequence. 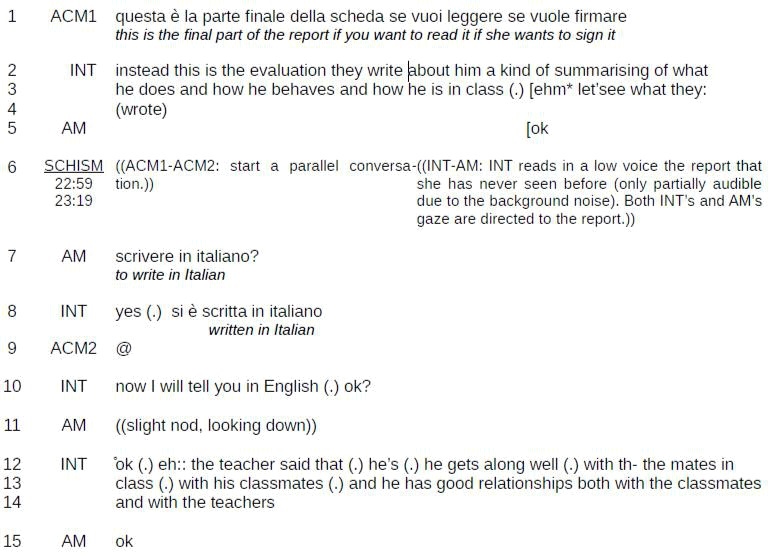 The first example comes from Davitti & Pasquandrea (2013), who analyse interpreter-mediated communication video-recorded in two different institutional settings, i.e. pedagogical and medical. Fig. 3 shows the opening of a dyadic sequence by the interpreter in order to coordinate the interaction and ensure effective, smooth communication. 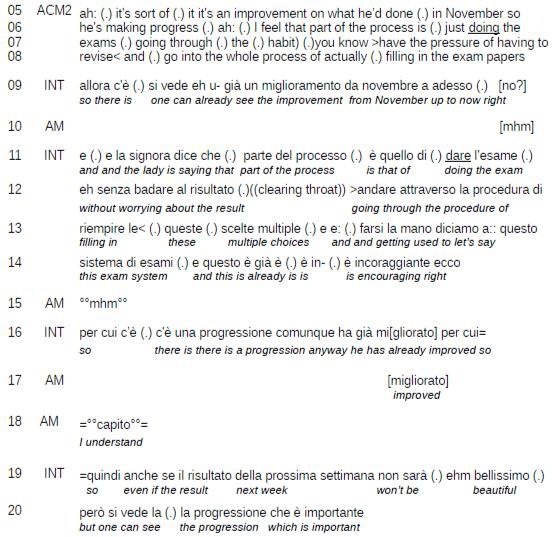 After the teacher’s (ACM2) assessment of the student’s progress (lines 5-8), the interpreter rendition (lines 9-20) is characterised by the addition of a series of evaluative remarks. In line with the bundle approach defined in 4.3, this sequence can then be compared and contrasted with one taken from the same corpus (see fig. 4), in which the interpreter once again expands on the teachers’ turn. The first part of the sequence is shown below in Figure 4. In the two sequences, the expansion produced by the interpreter leads to two radically different outcomes: in the first case (fig. 3), the expansion tends to “downgrade the seriousness of [the mother’s] concerns, thus implicitly discarding her viewpoint and reinforcing [the teachers’] position” (ibidem: 13). In the second case (fig. 4), the interpreter-initiated expansion provides “[the mother] with the opportunity to express herself” (ibidem: 18), e.g. by giving her the opportunity to raise a concern regarding her ability to speak Italian properly (line 7). This is a clear exemplification of how data selection based on a narrow focus can be implemented, showing different interactional trajectories stemming from seemingly similar phenomena. The two sequences can be presented to the students through a guided data session, in which they are encouraged to notice how the different outcomes depend on contextual and interactional factors. The aim is to show how active participation of the interpreters, in the form of adding, expanding, evaluating, is not necessarily tantamount to lack of professionalism; instead, their action should be evaluated on the basis of their consequence on the development of the interaction. To this end, the students can be encouraged to analyze the development of the interaction step-by-step, in order to recognize the interpreters’ actions, and to evaluate their consequences on the ongoing interaction. In another example (fig. 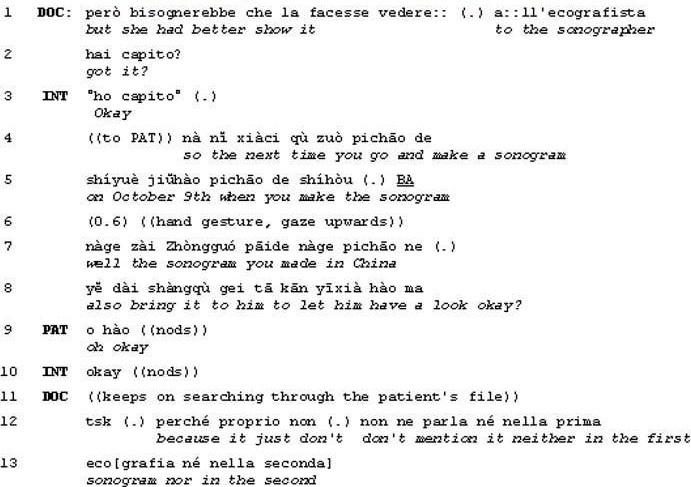 5, from Davitti & Pasquandrea, 2014), the transcript shows part of a sequence in which a doctor is discussing a concern brought about by the patient, a Chinese pregnant woman who reported to have a fibroma. The sequence in fig. 5 seems complete, in that the interpreter simply translates the doctor’s turn (lines 4-8), just adding some clarifications for the patient. However, the sequence progresses with the patient repeatedly reopening it, thus starting a series of dyadic sequences with the interpreter. The first of these sequences is shown in fig. 6. 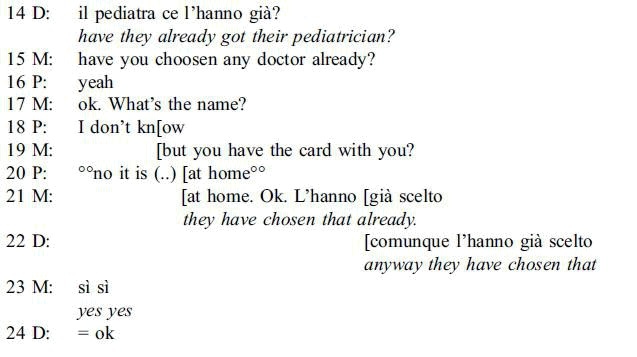 Eventually, as the interaction progresses, the interpreter is able to detect a further concern, which the patient does not state explicitly (namely that, not being able to speak Italian properly, she is worried about consulting a practitioner in a hospital where no interpreter is available). The authors demonstrate that the sequential structure of the interaction, particularly the way dyadic sequences are closed and reopened, is crucial to identifying and solving the patient’s concern. Again, disrupting the triadic format may, under certain circumstances, facilitate communication and mutual understanding. The nature of the sequence discussed in fig. 5 and fig. 6 is particularly apt for scrutiny through Stokoe’s CARM method. The sequence can be shown chunk by chunk, allowing the student to make their own suggestions about how it can be managed and what could follow. The comparative analysis between two (collaborative) settings is another aspect to be taken into account in the design of this part; a next step could be to contrast such sequences with similar ones collected in a more adversarial setting , for instance in a legal setting. At a more advanced stage in the module, the study of multimodal behaviour can be introduced. Multimodal analysis is a recent development in the field of DI studies, which has shown how the investigation of social interaction needs to include not only verbal language, but also “concurrently relevant semiotic fields” (Goodwin, 2000: 1499) such as gaze, gesture, posture, proxemics, body and space orientation, and object manipulation (Müller et al., 2013). Exposing students to data in which managing embodied resources proves crucial for the accomplishment of an interpreter’s tasks is important to raise trainees’ awareness of the complex and multi-faceted nature of real-life interaction. A preliminary reading for this phase of the module may be Goodwin & Goodwin (2004), which examines the notion of participation in its multimodal implications. Davitti & Pasquandrea (2017) discuss how participation in interpreter-mediated interaction is negotiated via embodied semiotic resources, examining two long sequences (over five minutes each), taken from two parent-teacher meetings involving the same actions, i.e. reading and signing the teachers’ report. Yet, the two sequences follow different trajectories: in the first case, the participation format is split between the two teachers, on one side, and the interpreter and the mother, on the other side; in the second case, the interpreter manages to maintain a triadic format throughout. The analysis shows how the different development of the two sequences depends on an interplay of speech, gaze, body positioning and object manipulation. Given the length of the sequences and the complexity of multimodal factors at stake, shorter excerpts of data need to be selected. From a pedagogical perspective, trainers could adopt a staggered approach, focusing on one multimodal resource at a time: for instance, attention can be firstly drawn to gesture, then gaze movement and body positioning, and so on, in order to show how such modalities cooperate to build up the interaction. For example, the analysis can focus on the pointing gesture which opens both sequences, as shown in fig. 7 and fig. 8. In both cases, one of the teachers points at the report, which is already on the table, thus making it relevant for the ongoing interaction. Starting from here, the two sequences can be shown in parallel, in order to examine when, how and why the participation frameworks vary. In this case, the CARM approach would prove useful, since it allows to follow the moment-by-moment development of the interaction in its minute details. Education refers to a form of passing on knowledge, skills, values and beliefs from one generation to another. It implies learning, acquisition and teaching. It requires sustained engagement in order to develop the knowledge, skills, values and beliefs. It refers to the ability to critically think about, put into practice and evaluate such knowledge, skills, values and beliefs. In the case of the module presented in this article, the main goal is not only to provide students with a theoretical understanding of and metalanguage to describe abstract notions, but to stimulate their ability to operationalise such notions and skills and apply them to real-life practice in order to reinforce their ability to cope with problematic situations. We believe that the suggested activities, if well planned and repeated regularly over a certain amount of weeks, can equip students with self-reflective and critical skills, which will be essential during their professional practice. Differently from more traditional theoretical modules, trainees are given the opportunity to directly apply the notions acquired and assess their implications. Moreover, by comparing authentic data with the existing literature, students can also develop the ability to read a research article and critically reflect on it. We have outlined some general principles and practical examples, which can be further developed and adjusted by individual trainers, based on their experience, teaching aims and preferences. In particular, sessions can be adjusted to different language pairs, and this methodology can also be applied to different interpreting modes, for instance technology-mediated interpreting (e.g. video-remote interpreting). A final, yet crucial, point is that the suggested approach needs to be applied longitudinally to achieve full efficacy. These activities should be integrated systematically into the interpreting curriculum, rather than proposed sporadically into a single, isolated course. Ideally, different module sessions could be linked and synchronised with language-specific classes and theoretical lectures, where similar concepts are explored and developed. Through its concurrent research-led and hands-on nature, this module can serve as a trait d’union between theory and practice of DI by providing students with a systematic framework for identifying the challenges that may arise in interpreter-mediated interaction and helping them reflect critically upon the dynamics and attitudes displayed by interpreters ‘in action’. Angelelli C. V. (2008), The Role of the Interpreter in the Healthcare Setting: A Plea for a Dialogue between Research and Practice, in Valero-Garcés C. & Martin A. (eds) Building Bridges: The Controversial Role of the Community Interpreter, John Benjamins, Amsterdam & Philadelphia: 139-152. Angelelli C.V. (2017), Anchoring dialogue interpreting in principles of teaching and learning, in Cirillo, L. & Niemants N. (eds), Teaching Dialogue Interpreting. Research-based Proposals for Higher Education, John Benjamins, Amsterdam & Philadelphia. Baraldi C. & Gavioli L. (eds) (2012), Coordinating Participation in Dialogue Interpreting, John Benjamins, Amsterdam & Philadelphia. Baraldi C. & Gavioli L. (2014), Are close renditions the golden standard? Some thoughts on translating accurately in healthcare interpreter-mediated interaction, The Interpreter and Translator Trainer 8(3): 336-353. Barsky R. F. (1994), Constructing a Productive Other, John Benjamins, Amsterdam & Philadelphia. Blakemore D. & Gallai F. (2014), Discourse markers in free indirect style and interpreting, Journal of Pragmatics 60(6): 106-120. Bolden G. (2000), Toward Understanding Practices of Medical Interpreting: Interpreters’ Involvement in History Taking, Discourse Studies 2(4): 387-419. Braun S. & Slater C. (2014), Populating a 3D virtual learning environment for interpreting students with bilingual dialogues to support situated learning in an institutional context, The Interpreter and Translator Trainer 8(3): 374-398. Bruner, J. S. (1961), The act of discovery, Harvard Educational Review 31(1): 21-32. Carroll J. & Beman V. (2015), Boys, inquiry learning and the power of choice in middle school English classroom, Adolescent Success 15(1): 4-17. Cirillo L. & Niemants N. (eds) (2017), Teaching Dialogue Interpreting. Research-based Proposals for Higher Education, John Benjamins, Amsterdam & Philadelphia. Cirillo L. & Radicioni M. (2017), (Role-)playing fair(s): Introducing interpreting students to business negotiations, in Cirillo L. & Niemants N. (eds) Teaching Dialogue Interpreting. Research-based Proposals for Higher Education, John Benjamins, Amsterdam & Philadelphia: 120-135. Cornelius-White J. (2007), Learner-centred teacher-student relationships are effective: A meta-analysis, Review of Educational Research 77(1): 113-143. Davidson B. (2002), A model for the construction of conversational common ground in interpreted discourse, Journal of Pragmatics 34(9): 1273-1300. Davitti E. (in press, 2018), Methodological explorations of interpreter-mediated interaction: novel insights from multimodal analysis, Qualitative Research. Davitti E. & Pasquandrea S. (2014), Enhancing research-led interpreter education: an exploratory study in Applied Conversation Analysis, The Interpreter and Translator Trainer 8(3): 374-398. 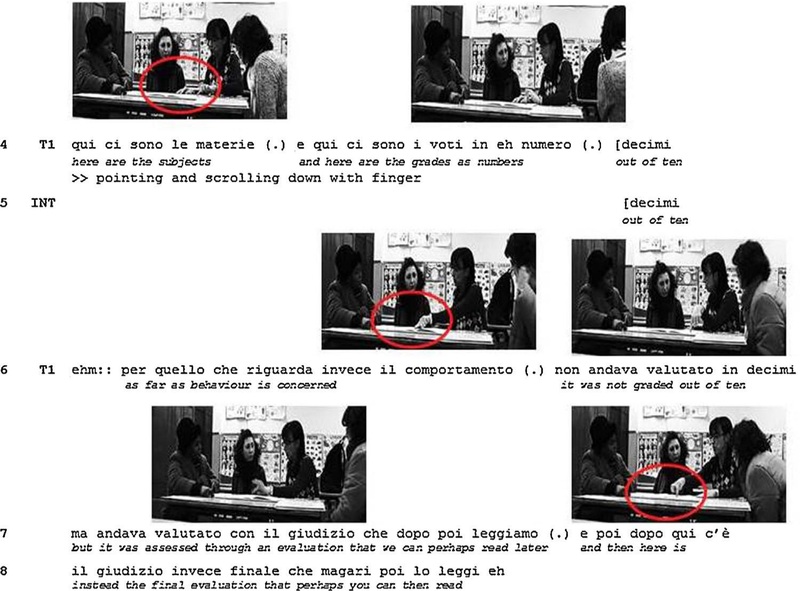 Davitti E. & Pasquandrea S. (2017), Embodied participation: What multimodal analysis can tell us about interpreter-mediated encounters in pedagogical settings, Journal of Pragmatics 107: 105-128. Dorier J. L. & García F. J. (2013), Challenges and opportunities for the implementation of inquiry-based learning in day-to-day teaching, ZDM 45(6): 837-849. Ericsson K. A. (2000/2001), Expertise in interpreting: an expert-performance perspective, Interpreting 5(2): 187-220. Ericsson K. A. (2004), Deliberate practice and the acquisition and maintenance of expert performance in medicine and related domains, Academic Medicine 79(10 Suppl): 70-81. General Overview, Academic Emergency Medicine 15: 988-994. Ertl A. & Pöllabauer S. (2010), Training (medical) interpreters. The key to good practice: MedInt: A joint European training perspective, JoSTrans 14: 165-193. Gavioli L. & Aston G. (2001), Enriching reality: language corpora in language Pedagogy, ELT Journal 55(3): 238-246. Goffman E. (1981), Forms of talk, Blackwell, Oxford. Goodwin C. (2000), Action and Embodiment within Situated Human Interaction, Journal of Pragmatics 32: 489-522. Goodwin C. & Goodwin M. H. (2004), ‘Participation’, in Duranti A. (ed.) A Companion to Linguistic Anthropology, Blackwell, Oxford. Hale S. (2004), The Discourse of Court Interpreting, John Benjamins, Amsterdam & Philadelphia. Have P. (2001), Applied Conversation Analysis, in McHoul A. & Rapley M. (eds) How to Analyse Talk in Institutional Settings: A Casebok of Methods, Continuum, London: 3-11. Inghilleri M. (2005), Mediating zones of uncertainty: interpreter agency, the interpreting habitus and political asylum adjudication, The Translator 11(1): 69-85. Kiraly D. (2000), A social constructivist approach to translator education: Empowerment from theory to practice, St. Jerome, Manchester. Kolb D. A. (1984), Experiential learning: Experience as the source of learning and development (Vol. 1), Prentice-Hall, Englewood Cliffs, NJ. Krystallidou D. (2012), On mediating agents’ moves and how they might affect patient-centredness in mediated medical consultations, Linguistica Antverpiensia, New series – themes in Translation Studies 11: 75-93. Krystallidou D. (2014), Gaze and body orientation as an apparatus for patient inclusion into/exclusion from a patient-centred framework of communication, The Interpreter and Translator Trainer 8(3): 399-417. Lave J. & Wenger E. (1991), Situated Learning: Legitimate Peripheral Participation, Cambridge University Press, Cambridge. Licoppe C. & Veyrier C.-A. (2017), How to show an interpreter on screen? The normative organization of visual ecologies in multilingual courtrooms with video links, Journal of Pragmatics 107: 47-164. Mason I. (2006), On mutual accessibility of contextual assumptions in dialogue interpreting, Journal of Pragmatics 38(3): 359-373. Mason I. (2012), Gaze, positioning and identity in interpreter-mediated dialogues, in Baraldi C. and Gavioli L. (eds), Coordinating Participation in Dialogue Interpreting, John Benjamins, Amsterdam & Philadelphia: 177-200. Merlini R. (2007), Teaching Dialogue Interpreting in Higher Education: A Research driven, Professionally Oriented Curriculum Design, in Musacchio M. T. & Henrot G. (eds) Tradurre: Professione e Formazione, CLEUP, Padova: 277-306. Merlini R. (2017), Developing flexibility to meet the challenges of interpreting in film festivals, in Cirillo L. & Niemants N. (eds), Teaching Dialogue Interpreting. Research-based Proposals for Higher Education, John Benjamins, Amsterdam & Philadelphia: 138-157. Metzger M. (1999), Sign Language Interpreting: Deconstructing the Myth of Neutrality, Gallaudet University Press, Washington, D.C.
Monacelli C. (2016), Methods to contextual madness: taking what is not given in confidential settings, in Bendazzoli C. & Monacelli C. (eds), Addressing Methodological Challenges in Interpreting Studies Research, Cambridge Scholars Publishing, Newcastle upon Tyne: 31-60. Müller A., Cienki E. ,Fricke & D. McNeill (eds) (2013), Body, Language, and Communication an international handbook on multimodality in human interaction, Mouton de Gruyter, Berlin. Niemants N. (2015), From role-playing to role-taking. Interpreter role(s) in healthcare, in Schäffner C., Kredens K. & Fowler Y. (eds), Interpreting in a changing landscape: Selected papers from Critical Link 6, John Benjamins, Amsterdam & Philadelphia: 305-319. Niemants N. & Stokoe E. (2017), Using the conversation analytic role-play method in healthcare interpreter education, in Cirillo L. & Niemants, N. (eds) Teaching Dialogue Interpreting. Research-based Proposals for Higher Education, John Benjamins, Amsterdam & Philadelphia: 293-322. Niemants N. & Cirillo L. (2016), Il role-play nella didattica dell’interpretazione dialogica: focus sull’apprendente. In Grassi R. & Andorno C. (eds), Dinamiche dell’interazione. Prospettive di analisi e contesti applicativi, Atti del XVI Congresso AItLA, Officinaventuno, Milano: 301-317. Pöchhacker F. (2012), Interpreting participation: Conceptual analysis and illustration of the interpreter’s role in interaction, in Baraldi C. & Gavioli L. (eds), ), Coordinating Participation in Dialogue Interpreting, John Benjamins, Amsterdam & Philadelphia: 45-70. Pöchhacker F. (2004), Introducing Interpreting Studies Routledge, London. Pöchhacker F. & Shlesinger M. (2007), Healthcare Interpreting, John Benjamins, Amsterdam & Philadelphia. Pöllabauer S. (2005), I don’t understand your English, Miss, Dolmetschen bei Asylanhörungen, Gunther Narr Verlag, Tübingen. Ray, W. E. (1961), Pupil discovery vs. direct instruction. Journal of Experimental Education 29: 271-280. Roy C. (2000), Interpreting as a Discourse Process, Oxford University Press, Oxford. Sidnell J. & Stivers T. (2012),. The Handbook of Conversation Analysis, Wiley, New York. Stokoe E. (2011), Simulated interaction and communication skills training: The ‘Conversation Analytic Role-play Method’, in Antaki C. (ed. ), Applied conversation analysis: Changing institutional practices, Palgrave Macmillan, Basingstoke: 119-139. Stokoe E. (2014), The Conversation Analytic Role-play Method (CARM): A Method for Training Communication Skills as an Alternative to Simulated Role-play, Language and Social Interaction 47 (3): 255-265. Tebble H. (2012), Interpreting or interfering?, in Baraldi C. & Gavioli L. (eds), Coordinating Participation in Dialogue Interpreting, John Benjamins, Amsterdam & Philadelphia: 23-44. Valero-Garcés C. (2009), Training and curriculum design: The value of internships in Community Interpreting. Pros and cons. Paper presented at CIUTI Symposium: Community Interpreting. Training and Research at University Level (University of Graz, 17-19 September 2009). Vygotsky L. S. (1978), Mind in Society: The Development of Higher Psychological Processes, Harvard University Press, Cambridge MA. Wadensjö C. (1998), Interpreting as Interaction, London, Routledge. Wadensjö C. (2001), Interpreting in crisis: the interpreter’s position in therapeutic encounters, in Mason I. (ed. ), Triadic Exchanges: Studies in Dialogue Interpreting, St. Jerome Manchester: 71-85. Wadensjö C. (2014), Perspectives on role play: Analysis, training and assessment, The Interpreter and Translator Trainer 8(3):437-451. Wenger E., McDermott R. & Snyder W. M. (2002), Cultivating communities of practice, Harvard Business School Publishing, Boston. CARM (Stokoe, 2011; 2014) is a method that employs databases of video and audio recordings of authentic data, with aim to provide “an evidence base for making decisions about effective practice and communication policy” (http://www.lboro.ac.uk/enterprise/carm/use-carm). For a detailed discussion of the application of CARM to interpreter-mediated data, see Niemants & Stokoe (2017). The practice of data session, i.e. an informal gathering of researchers in which excerpts of data are examined and participants are invited to bring in anything they find noteworthy, has a well-established tradition in Conversation Analysis. SHIFT in Orality – Shaping the Interpreters of the Future and of Today (https://www.shiftinorality.eu/en). Elena Davitti is Senior Lecturer in Translation Studies at the Centre for Translation Studies, University of Surrey (UK). She holds a PhD in Translation and Intercultural Studies from the University of Manchester and an MA in Conference Interpreting from the University of Bologna at Forlì. Her research has mostly focused on (dialogic) interpreter-mediated interaction that she has analysed through multimodal lenses. Her interests include technologies applied to interpreting, particularly video-mediated and mobile interpreting, interlingual respeaking and innovations in interpreter education. Sergio Pasquandrea was awarded his PhD in Linguistics at the University of Pisa in 2007 and worked as a post-doctoral researcher at the Università per Stranieri (University for Foreigners) of Perugia from 2007 to 2010, then at the University of Perugia from 2010 to 2015. His research has covered the fields of conversation analysis, discourse analysis, interactional sociolinguistics and pragmatics. His interests include the study of face-to-face interaction, both in everyday and in institutional contexts, and the construction of personal and social identities, both in conversation and in written texts.